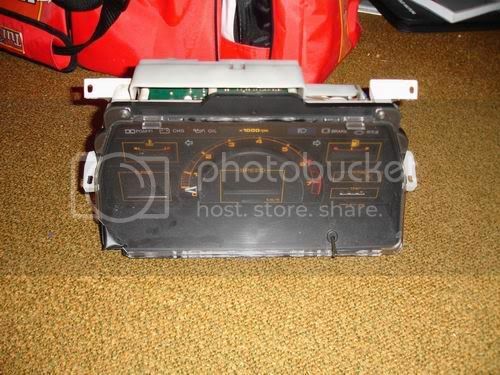 Many of you will have experienced varying degrees of malfunction of the stock “digital boost gauge” on your instrument cluster. There are many posts scattered about the forum either complaining about this or explaining how to fix it. 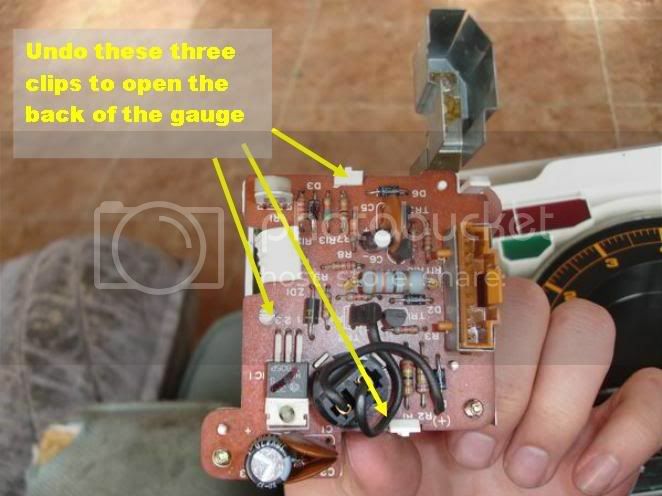 Here is an illustrated step by step guide on how to remove the boost gauge and resolder it so it goes again. I know the gauge is useless and doesn’t provide any sort of helpful information, it’s just nice to have it working for completeness sake. The pictures are taken from a T2, I’m not sure if there’s any difference if you’ve got a T1. First remove the screws from where the arrows are, you should then be able to pull the black shroud off from round the sides of the cluster, you need to pop the top out before the bottom. With the black shroud off you have access to the bottom of the top cover, there should be three screws holding it on from underneath. Undo them and remove the top cover. 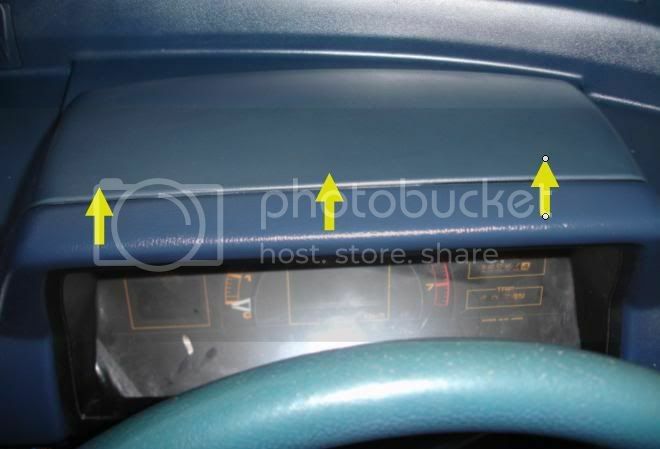 Remove the four bolts holding the cluster in, I couldn't get them all in the photo, but the bottom arrows are pointing in their general direction. You can now pull the cluster forward so you can get at the connections at the back. I don’t have photos of this bit, but there are four things that need to be unplugged, three lots of wires and the speedo cable. The two smaller wire plugs are easy to get out, the large one is a bit harder, and the speedo is a pig. 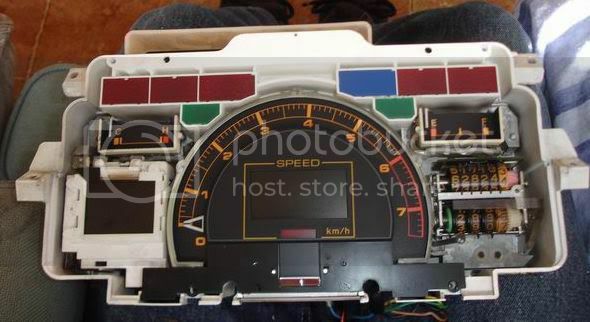 There is a plastic clip around the speedo connector, it’s easier to see from the outside of the car through the windscreen. 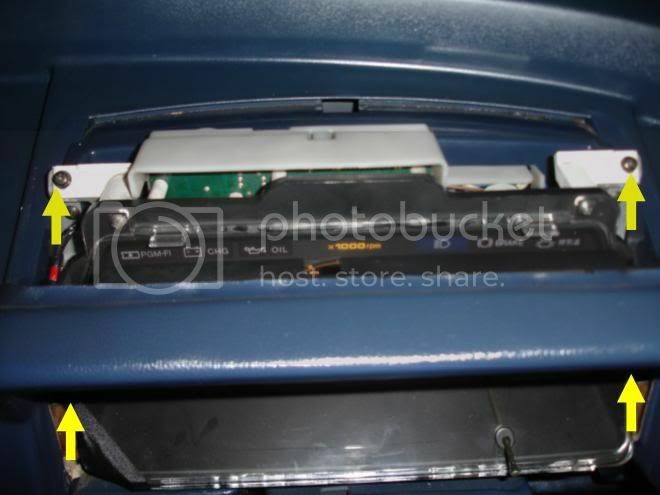 Either with your fingers or some sort of poking device, get the plastic clip to let go, and you can then remove the cluster, the speedo cable will just fall out. Here is the cluster once it's out. 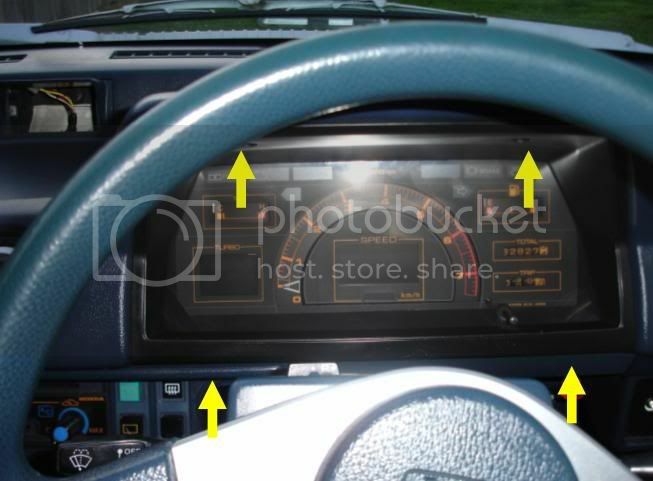 You need to be able to remove the speedo from the cluster to be able to get the boost gauge out. Undo the four screws holding the clear cover onto the front of the cluster and remove it. 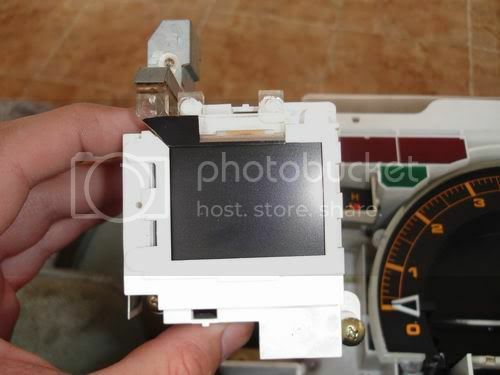 Once you have the gauge out, you need to open it up to find the bad solders. After it's open it will be in two parts joined by a cable. Inspect all the solders for evidence of drying and cracking. 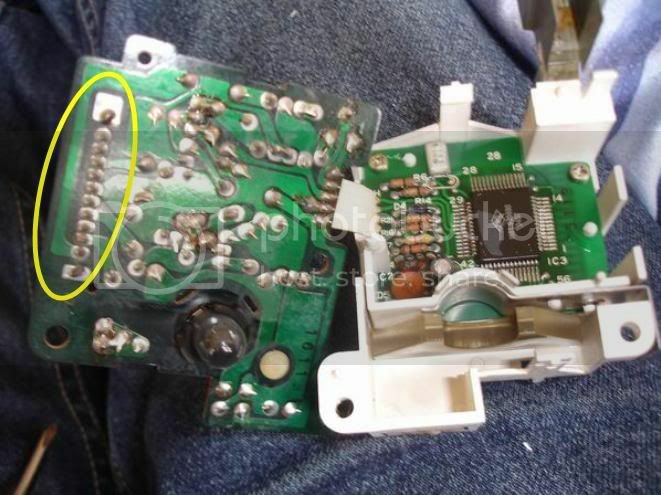 All the ones circled in this picture were suspect on mine, so I resoldered all the joins on the left half. The joins of the right half all looked good. 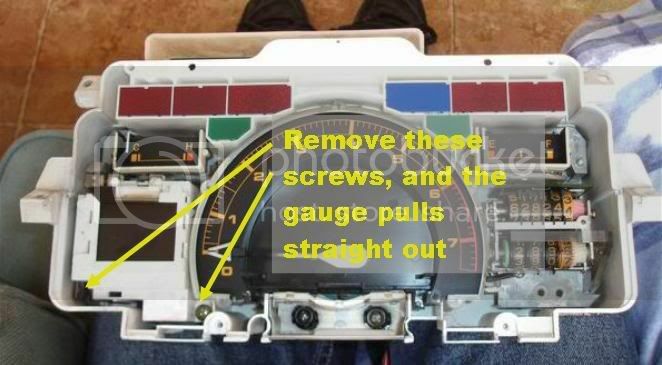 Now simply reverse the process of taking it apart, and you should have a working boost gauge! 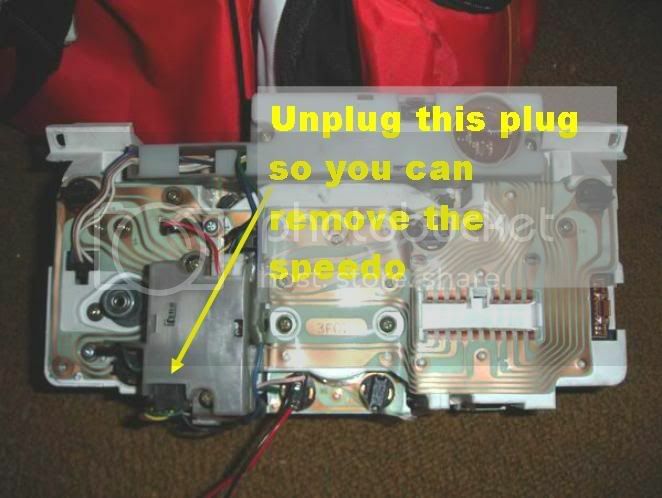 Note: It's probably a good idea to replace all the bulbs in the cluster since you've got it out, cause it's not something you want to be doing very often, the speedo cable can be very very tricky to put back on. -Thanks to Mike_NZ for writing this guide!